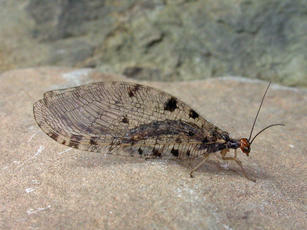 Identified by its large size (around 25 mm including wing length) and spotted wings. Streamside vegetation, especially in woods. Larva hunts in wet moss and debris. Scattered records from across England and Wales, mainly from the south and west. Infrequently recorded in Leicestershire and Rutland. There were approximately 9 validated records for this species according to the 'Checklist of Neuroptera and allies in VC55' published in 2018.